Los Angeles-based chef Curtis Stone has been working with Chrysalis for five years after hearing a Chrysalis client speak at their Butterfly Ball about getting ready for the job. Stone’s first employee through Chrysalis was Darryl who started at Maude in Beverly Hills five years ago. Stone also hired Byron through Chrysalis in 2016 as he was opening his second restaurant Gwen LA. Byron joined the team as a dishwasher and today has a managerial position and keys to the restaurant. Darryl is also still with the restaurant group and is a supervisor at Gwen LA and has keys as well. Byron came from a small town in Texas. Raised in a cycle of drugs, he came to Los Angeles to be near his son and found himself homeless. Needing a job, he spoke to a man on the street who was sweeping the sidewalk who told him to check out Chrysalis. Byron completed the program at Chrysalis and began working at Gwen LA. “What I have been exposed to, I could never have imagined. 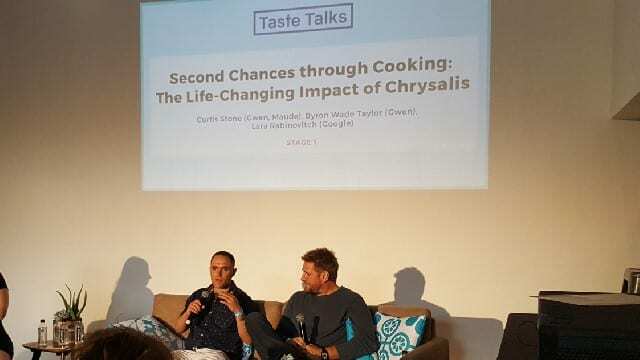 Curtis is not just a boss, he is also like a brother,” Byron told the crowd at Taste Talks. The benefits are two-sided. Chef Curtis Stone has provided employment for 40 people through Chrysalis over the past four years and in exchange he has a better staff retention rate with his Chrysalis employees than the non-Chrysalis employees. He is not alone. A number of restaurants across Los Angeles are working with Chrysalis. Last year, 347 jobs were obtained in the food service industry by clients served at Chrysalis. This entry was posted in Lifestyle and tagged Chrysalis, Curtis Stone, Los Angeles, Napa Valley Register, second chances, social responsibility, Taste Talks by Allison Levine.